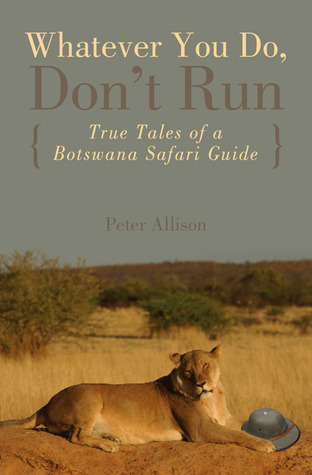 Title: Whatever You Do, Don't Run: True Tales of a Botswana Safari Guide, by Peter Allison. Publisher: Lyons Press, 2007. 200 pages. This memoir is a collection of tales from Peter Allison's 12 years as a safari guide, mostly in Botswana. Each chapter is a free-standing tale of a single adventure, some mere vignettes, some lengthy. One chapter is a narration of the story of Sir Seretse Khama, the first president of Botswana and the man largely responsible for making the country what it is. The title is taken from the sound advice on what to do when faced with a predator, because "food runs." My Mom recommended this book, and she was spot on. As a fan of Alistair McCall Smith's "#1 Ladies Detective Agency" books, it was fun to see another view of Botswana. And though I'm not 100% sure why, this book caught my fancy and tickled my funny bone, and I zipped through it almost non-stop. Allison has a dry sense of humor, usually deployed at his own expense (though he doesn't spare the idiosyncrasies--or the idiocies--of the tourists he guided). The tone of the book is generally humorous, though there are poignant moments that help keep it from feeling too superficial. Allison was a very young man when he started guiding (about 19), and most of the guides were young men (and a few women). Behavior off-duty often reflected that status, but these were also professionals, so Allison and his co-workers were always up and always "on" when the clients were present. For a light, fun, and occasionally laugh-out-loud glimpse into another life in another place, Whatever You Do, Don't Run is a good bet. I might have liked a little more sense of time and narrative line (I was never sure if the stories were more or less in chronological order, or just arranged to make for a decent narrative structure, or hap-hazard), but I smiled, chucked, and occasionally snorted my way through them all regardless. Highly recommended for some light reading on a rainy afternoon or two. Not suitable for young children, but I would guess that animal lovers from maybe 12 or so up would encounter nothing they haven't heard at school (mild profanity and occasional discussions of the reproductive activities of the animals), and would have a fun time with it. They might also be inspired to run away to Africa to be safari guides. Depending on how you are feeling about your teen, this could be a good thing. Disclaimer: I borrowed Whatever You Do, Don't Run from my (digital) library and received nothing from the author or the publisher in exchange for my honest review. The opinions expressed herein are my own and those of no one else. LOL! James Herriot never had it like this! Though as I recall he and his compadres were even more often intoxicated. As a kid in a tee-totaling home I recall being rather shocked by that.